After dental decay, gum disease is the second most common disease worldwide. In the United States it affects 30-50% of the population, with 10% being severely affected. This article will help you recognize the condition and understand how to treat it. People spend large amounts of money each year on cosmetic dentistry to improve the appearance of their smile, and most people wish to keep their own teeth for as long as possible. Everyone is aware of the danger of dental decay and the need to maintain oral hygiene, but much fewer people know that gum disease is the number one cause of tooth loss in people who are aged 30 and above. Periodontitis is a disease of the gums and the tissues that surround and support the teeth. The name derives from Latin where “peri” means around, “odont” means tooth, and “itis” means inflammation. The peridontium includes the gums, the alveolar bone around the tooth, and the ligament of connective tissue that holds the tooth in its socket. The ligament also acts as a cushion between the tooth and bone. Periodontis usually begins with an infection of the gums called gingivitis. If this is left untreated the infection attacks the fibres and ligament supporting the tooth in the jaw, and causes inflammation and progressive destruction of the alveolar bone around the tooth that anchors it in place. This is now periodontitis or periodontal disease. Often the gums will recede, exposing the root surfaces, and teeth will be more sensitive to heat and cold. The progressive loss of bone can lead to the loosening of teeth and their eventual loss. Periodontitis or periodontal disease is caused by a buildup of dental plaque. Plaque is a sticky, bacterial substance that forms on teeth, particularly around the gum line. It comes from bacteria which are found naturally in the mouth, and in small amounts it is colourless and fairly harmless. However when it accumulates around the gum margin the bacteria produce toxins and acids that irritate the gums and the plaque builds into a soft whitish deposit that is clearly visible. This then causes gingivitis or bleeding gums. If this is not treated the plaque hardens to form calculus using the calcium ions from saliva in the mouth. Calculus is not removed by brushing or flossing and is an ideal site for the bacteria to invade the gum tissues. The plaque will eventually move below the gum line where the harmful bacteria multiply rapidly in the airless environment, and thrive in the gap between the tooth and the gum. The bacteria and the toxins they secrete then start to damage the gum, the ligament that attaches the tooth and the bony support of the tooth, eventually leading to loosening of the tooth. In some cases the inflammation caused by the bacteria can cause the body to essentially turn on itself and help breakdown and destroy the periodontal ligament and bone of the tooth socket. This response is determined mainly by genetics and also the state of an individual’s immune system. Some people are much more at risk of developing periodontitis than others. Although the primary cause is dental plaque, some people are genetically more susceptible to periodontitis developing. Several medical conditions and diseases, including diabetes, Downs syndrome, heart disease, high blood pressure, stress, pregnancy, certain medications (anti-convulsant and contraceptive pills) and lifestyle habits like smoking, can reduce the immune systems’ ability to overcome gum infection and increase susceptibility to periodontitis. Often there is little or no pain involved with gum disease in the early stages, so many people do not know they have it until the disease has significantly progressed. It is therefore important to check yourself for any symptoms, and to have regular dental check-ups. If your gums bleed when you brush your teeth, don’t ignore it just because there is no pain involved, as it is very likely an early sign of periodontitis. In the early stages of peridontitis the treatment consists of non-surgical scaling and root planing. This involves cleaning below the gumline with an instrument called a curette to remove plaque, calculus, and inflamed soft tissue from around the tooth. Root planning smoothes rough spots where bacteria will collect on the tooth root. The clean smooth surface assists the gums to reattach to the tooth. In the early stages this may be all that is necessary, provided excellent oral hygiene is followed at home. The aim is to remove the bacterial colonies so that the gum will no longer be inflamed and shrink enough to eliminate the gap or pocket between gum and tooth so that bacteria can not grow there. In more advanced cases, where the pockets round the teeth are deep, surgery is required. A flap procedure may be performed, where the gum tissue is lifted away from the teeth and all underlying calculus, tartar and inflamed tissue is removed. The gums are then replaced and sewn in place so that they fit snugly around the teeth. Healing takes from one to three weeks and there will be some discomfort. Soft tissue grafts are sometimes used to fill-in places where gums have receded, and bone grafts can be used to replace bone destroyed by periodontitis. Treatment can also include the use of antibiotics to reduce gum inflammation. Prevention of periodontitis is best achieved by a combination of good daily oral hygiene and regular dental visits. 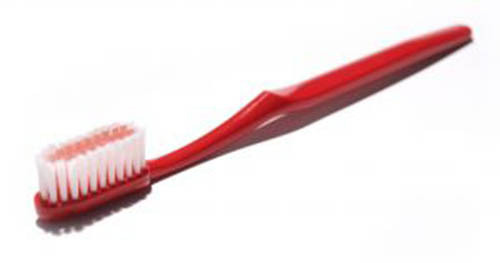 Brush your teeth at least twice daily with a soft tooth brush to prevent damage to tooth enamel. When brushing, attempt to direct the bristles of the toothbrush under the gum line to disrupt bacterial growth there, and ensure you clean behind your back teeth. Daily flossing, tongue cleaning and the use of mouthwash can all reduce the accumulation of dental plaque. Visit a dentist every three to six months who can monitor your gum health and clean and scale your teeth to remove any build up of calculus then apply fluoride to help prevent tooth decay and sensitivity. Remember prevention is always better than cure, and without daily oral hygiene, you can not stop periodontitis.